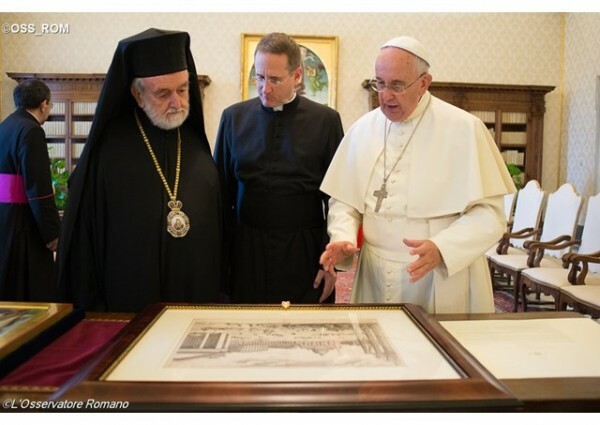 (Vatican Radio) Pope Francis on Saturday met with a delegation of the Ecumenical Patriarch of Constantinople, Batholomew I, which is in Rome for the Feast of Sts. Peter and Paul, which is on Monday. “Your presence at the celebrations of our feast testifies once again to the deep relationship between the sister Churches of Rome and Constantinople, foreshadowed by the bond which unites the respective patron Saints of our Churches, the Apostles Peter and Andrew, brothers in blood and faith, united in apostolic service and martyrdom,” said Pope Francis. The Holy Father took the occasion to renew his support for the work of the Joint International Commission for Theological Dialogue between the Catholic Church and the Orthodox Church.